With the advent of technology and more ways to communicate, many healthcare professionals and insurance programs have begun offering services using telemedicine—or the ability to interact with patients and treat them without an office visit. There can be several advantages to telemedicine. 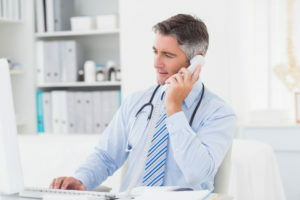 If you live a long way from a doctor, or if you have trouble traveling, telemedicine can allow you to consult with a physician without the extra burden of travel. This can save both time and money. Telemedicine may allow medical care professionals to treat you while charging less, too, since telemedicine can save time, or allows physicians assistants or nurse practitioners to handle routine issues without needing a full-fledged doctor. If it’s a reoccurrence of a condition, then treatment can be handled faster. Telemedicine can also reduce costs on follow-up treatments by making sure patients take their medicine properly and do proper follow-up care. Telemedicine also can be helpful in the doctor’s office, by allowing a physician to consult with experts in remote locations by sharing x-rays, test results, and other information. Physicians who are treating a rare or unusual illness can lean on the expertise of another professional who may be thousands of miles away. Telemedicine may also allow doctors and patients to interact more frequently, since it’s more convenient. Patients can ask more questions and have a stronger relationship with their doctor. And telemedicine can also lead to better care, through the more effective use of technology. But telemedicine isn’t a cure for everything. There are still times when it’s best for a patient to come face to face with his or her physician, and there are treatments like physical therapy that have to be done where there’s proper equipment and supervision. But take a look at what your insurance plan and your doctors offer when it comes to telemedicine. You may find that it can add convenience and possibly reduce your costs for good health.